A variety of systems may be available and other systems will be described in later posts. One strategy to avoid air defences is to fly low, exploiting nap of the earth (NOE) techniques. This is particularly effective against line of sight systems such as lasers. Possibly the defender may use an airborne laser system for a “look-down, shoot down” defence but such aircraft will in turn be vulnerable to an attacker’s anti-aircraft systems. On TS Earth low level penetration attacks are conducted by cruise-UCAVs. As we will often find in TS the cruise-UCAV is a mixture of familiar and different. A typical cruise UCAV at first glance does not seem that different from modern cruise missiles. Low level flight places some practical restrictions on the design of an aircraft. Unless flying over the sea or very flat terrain the undulations of the ground make speeds of more than 570 mph impractical. There is little point in designing a cruise missile with supersonic capability since it cannot use it! Subsonic speeds also help contribute to the stealth of the aircraft. Low level air is denser than at higher altitudes and this favours an aircraft with a smaller wing area to give a smoother flight. This is why cruise missiles have small stub-wings and can fly using body lift. 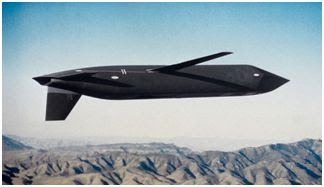 The cruise-UCAV not only looks like a cruise missile but is of a similar size. It is about 20 ft long and under 2 ft in width, allowing it to be launched from the various systems that were already in service. Thus, other than a little more attention to stealth features the TS cruise-UCAV looks very similar to contemporary cruise missiles. Internally the UCAV has a much more sophisticated guidance and sensor system and will probably be piloted by a LAI. It may use ramjet propulsion rather than a turbojet. Rather than a fixed warhead the UCAV has an internal weapon-bay capable carrying a wide variety of missiles or submunitions. The weapon bay can carry other systems such as reconnaissance packs, EW devices, cyberswarms, surveillance fluff/ dust, less-lethal weapons, chemicals and so on. Fitted with air to air missiles it can engage airborne targets. The UCAV is designed to release its payload close to the target(s) and return to friendly airspace if possible. Most modern cruise missiles are seldom used at their full potential range so a device that can attack its target and then return for reuse is a logical progression. 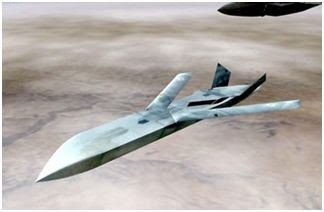 Like a manned aircraft the cruise-UCAV gives the option of aborting or redirecting an attack right up to the moment that the weapons are released. The weapon-bay makes the cruise-UCAV a very versatile system. It can fly down a road column, dropping a bomb on each vehicle it passes over. Over a clustered target such as a staging area it can release all of its munitions at once. In a previous post I mentioned that robot combat systems can be hard landed by a glide-bomb type capsule. 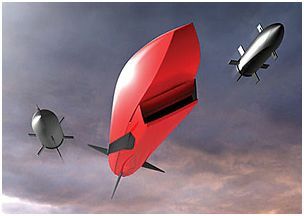 A cruise-UCAV could bomb a target then deploy robot combat systems to mop-up, assess damage and hinder repair efforts. The UCAV’s own sensors can also assess attack effects and use this information to customize follow-up attacks. Ideally the cruise-UCAV releases its weapons from outside laser engagement range but some mission profiles do not allow this. Cruise-UCAVs have ablative surfaces to provide some protection from point defence lasers. Cruise-UCAVs are launched from standard launching tubes mounted on ships, submarines or ground vehicles. Alternately they are dropped from larger aircraft. Landing system varies with different designs. Some simply cut engine and deploy a parachute. Other designs land conventionally on a skid or belly land on water or a special landing surface. Mid-air recovery by cargo aircraft is also practiced. The cruise-UCAV can be modelled as a smarter, reusable version of a modern cruise missile. Based on contemporary examples the weapons-bay can be assumed to have a capacity of 1,000lbs and 28 cubic feet. Improvements in engine and avionics technology may free up more space inside a TS cruise-UCAV so the GM may allow capacity to be increased by 50%.